Jet Set Go Game - Download and Play Free Version! Do You Have What It Takes to Run a Successful Travel Agency? Does travel hold a special place in your heart? If so, Jet Set Go is a must have game for your collection! When potential travelers walk in the door, an icon appears above their heads indicating the kind of service they are looking for. Some people know exactly where their ideal destination is, but others could use some help deciding. Click and drag the ones who have a set destination right up to the front to book their flight and seat the others at the brochure booth. Make sure to answer any questions they have when they ask! It's important to provide prompt service without keeping anyone waiting! Once you've managed to book an entire plane full of people, it's time to take flight! Each destination has its own unique minigame that you get to play in order to increase your satisfaction level. These minigames are very interactive and you'll find yourself cracking coconuts in half, serving up gourmet cuisine and more! This livens up the game with a considerable amount of variety and action! Use your earnings to update the looks of your travel agency. Potential travelers will be more patient in a nicer looking and more comfortable environment. Once all 3 bars have been filled, you will move forward and advance in the game. 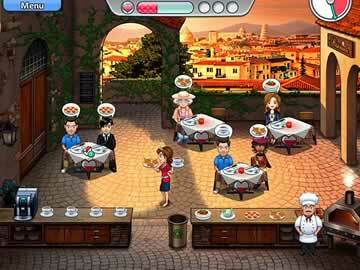 This time management game is perfect for players of all skill levels. Are you a time management master? Then test your skills against the expert mode. Are you looking for a relaxing, slower paced time management experience? Casual mode is just the ticket for you! Having two difficulty modes gives this game great replay value. This game is well crafted with vibrant graphics, pleasing music and quality sound that really add to the experience. 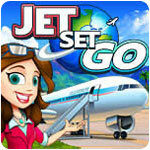 Jet Set Go provides up to 5 different user accounts, making this game easy to share with your friends and family. Are you ready? Get set and go traveling with Jet Set Go!